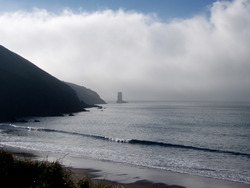 Trabeg or Kinard in Kerry is an exposed beach break that has pretty consitent surf and can work at any time of the year. 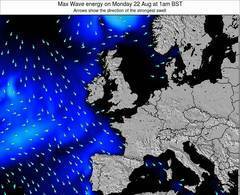 Works best in offshore winds from the north northeast with some shelter here from north winds. Handles onshore winds better than most spots Most of the surf here comes from groundswells and the best swell direction is from the southwest. The beach breaks offer lefts and rights as well as a left hand reef break. Best around low tide when the tide is rising. The location means that it never gets crowded. Take care to avoid the rocks. À Trabeg or Kinard (0 km). At ValentiaObservator, 21 km from Trabeg or Kinard. The two graphs above are also combined in the single Trabeg or Kinard surf consistency graph. Also see Trabeg or Kinard surf quality by season and Trabeg or Kinard surf quality by month. 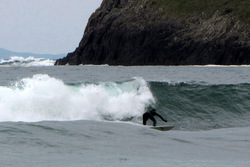 Compare Trabeg or Kinard with another surf break. The closest passenger airport to Trabeg or Kinard is Kerry Airport (KIR) in Ireland, 47 km (29 miles) away (directly). The second nearest airport to Trabeg or Kinard is Shannon Airport (SNN), also in Ireland, 109 km (68 miles) away. Third is Cork Airport (ORK) in Ireland, 122 km (76 miles) away. Waterford Airport (WAT), also in Ireland is the fifth nearest airport to Trabeg or Kinard and is 213 km (132 miles) away. 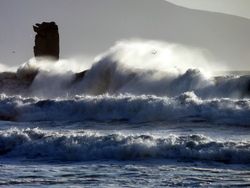 Ceci est la page Surf-Forecast pour Trabeg or Kinard, Kerry. Utilisez les onglets ci-dessus pour voir la température de la mer à Trabeg or Kinard, photos pour Trabeg or Kinard, prévisions de houle détaillées pour Trabeg or Kinard, prévisions de vent et météo, webcams pour Trabeg or Kinard, conditions de vents en temps réel à partir des données de la station météo de Kerry et prévisions des marées pour Trabeg or Kinard. Les cartes de houle pour Ireland afficheront une image agrandie de Ireland et des ses mers environnantes. Ces cartes de houles peuvent êtres animées pour montrer les différents composantes de houle, la hauteur, la période et l'énergie des vagues avec les prévisions météo et prévisions de vent. Des observations en temps réel du temps et de l'état de la mer sont fournies grâce aux bouées marines de Ireland, des navires de passages, et des stations météo côtières. Toutes les pages de prévisions pour ce spot de surf ont un Vagu-o-Mètre Local et Global pour facilement trouver les meilleurs spot de surf à proximité de Trabeg or Kinard.